In my first weeks at the Crag Law Center, I had the opportunity to join Staff Attorney Tanya Sanerib and Crag’s clients on a camping trip in search of marbled murrelets, a rare seabird threatened by logging. Crag represents Cascadia Wildlands, the Center for Biological Diversity, and the Audubon Society of Portland in a lawsuit against Governor Kitzhaber and Oregon State forestry officials for violating the Endangered Species Act. Despite the continued decline in marbled murrelet populations, Oregon persists in clearcutting murrelet occupied habitat in the Tillamook, Clatsop, and Elliott State Forests. Marbled murrelets were listed as a threatened species in 1992. The seabird flies inland to nest and raise its young in mature and old growth forests. Due to murrelets’ large webbed feet, the birds require thick branches on which to land for nesting. The loss of such habitat jeopardizes the survival of this threatened seabird. In search of murrelets, Tanya and I camped out on a logging road in preparation for an early morning of birdwatching. With alarms set for 4 am, we woke to brave the rain and dark to listen for the distinct call of the marbled murrelet. We listened carefully as the forest stand slowly awoke and watched as the sun rose. While we were unable to detect a murrelet that morning, I was able to gain a better understanding of the importance of mature forest stands in the protection of birds such as the marbled murrelet. Crag filed a complaint in federal district court in Portland, Oregon alleging that Oregon is violating the “take” prohibition for threatened and endangered species. While a state must obtain a permit to harm a threatened species under the Endangered Species Act, Oregon continues to allow the clearcutting of state forests without a permit. 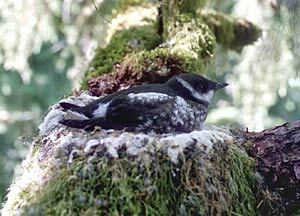 Crag seeks to force the State to comply with federal law by protecting marbled murrelet habitat. Not every summer legal clerk has the opportunity to camp out and birdwatch before beginning the workday. And, even more exciting and encouraging than a camping adventure, this lawsuit has already led the Oregon Department of Forestry to suspend operations on ten timber sales! I am grateful for the experiences I’ve had working to protect the natural environment both in and out of the office at the Crag Law Center.